Now that we have all the info, we just need some elbow grease and get to work! We need to follow the upgrade guide, and make sure not to miss any of the steps. That should complete the bulk of the job. 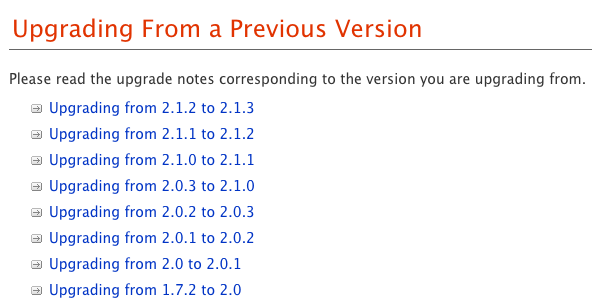 Based on this upgrade experience, the most time consuming part of my upgrade has been between version 1.7.2 and 2.0.0. The refactoring part of all models and controllers (upgrade steps 6 and 7 of 1.7.2 to 2.0.0) took a while, especially if the application has plenty of controllers and models! The merging of configuration files was quite tedious as well. Overall, I must say that the experience was quite smooth. That’s all from me, good luck with your upgrades and let me know how it goes!